Vargas is named after Venezuela’s first non-military president, José María Vargas. The state’s economy has traditionally revolved around airfield and harbour activities, and the country’s largest airport and seaport are here. 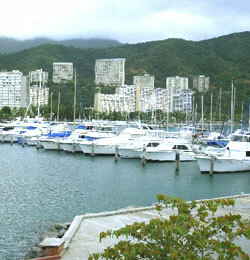 Vargas’ capital and main port is La Guaira. It is the country’s historic port of entry, and receives major passenger ships and cruiser lines, and consumer goods going to nearby Caracas, Miranda and Aragua states. The old colonial town is still intact and climbs up the hill leading to the forts of El Vigia and La Polvora. The state has always buzzed with lots of economic activities. The promise of great growth made investing in residential areas, clubs, hotels and restaurants here popular. But in 1999, the state suffered a major tragedy: torrential rains brought huge floods that caused mudslides. Small towns disappeared, roads and bridges collapsed and thousands of lives were lost, forcing a huge migration out of Vargas. Many hotels, restaurants and clubs were lost or closed, and the value of residential properties went down. The tourism industry disappeared and Vargas underwent a painful recovery. Today Vargas’ tourism is slowly picking up again. Anare, Playa Grande, Catia La Mar and Macuto are some of the seaside hotspots here. Caraqueños flock to Macuto on weekends as it has many sidewalk restaurants offering the best dining on the coast and a full service marina for sailboats and yachts. The state now has a considerable number of residential properties, hotels, clubs, spas, restaurants and recreation facilities, and there is an increase in real estate investment.